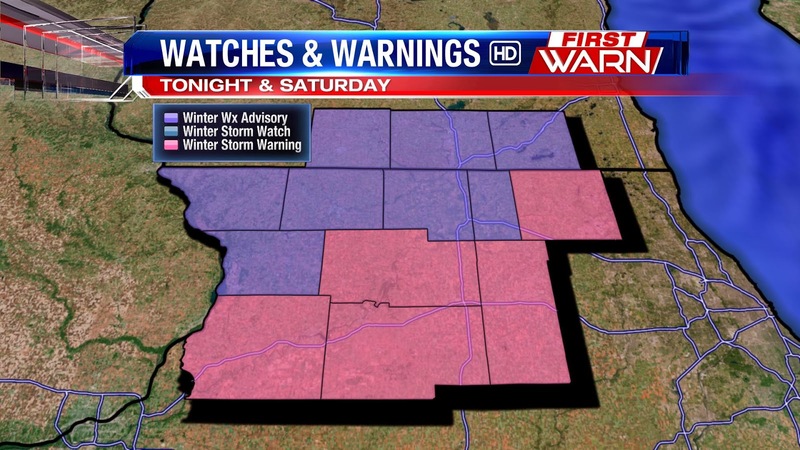 Significant snowfall is expected for the Stateline late Friday night into Saturday. If the forecast holds, it will be one of the largest snowfalls we've seen this season. Here's a look at the latest Winter Storm Impact Forecast. Snow is expected to ramp up after midnight and continue through Saturday evening. The heaviest of the snow will fall Saturday morning with snowfall rates of 1-2" an hour possible during that time. This will have a major impact on anyone traveling. If you have plans on Saturday, especially in the morning, you might want to think about rescheduling or postponing them. 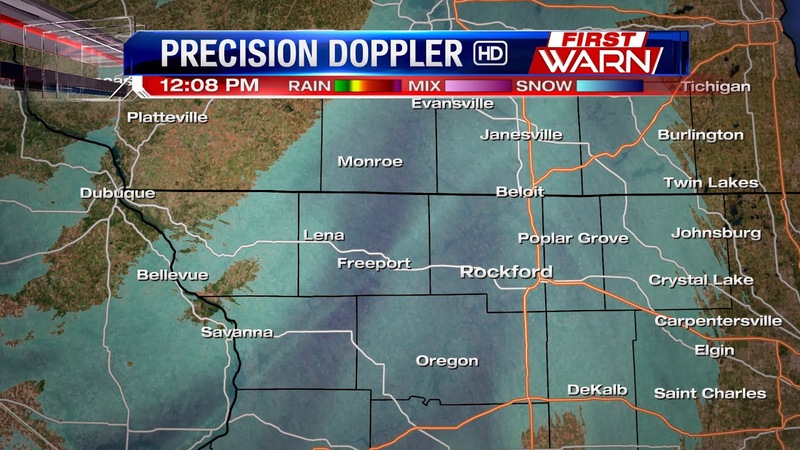 Snow will lighten for the afternoon and evening with the heaviest snow totals south of the Rockford metro. 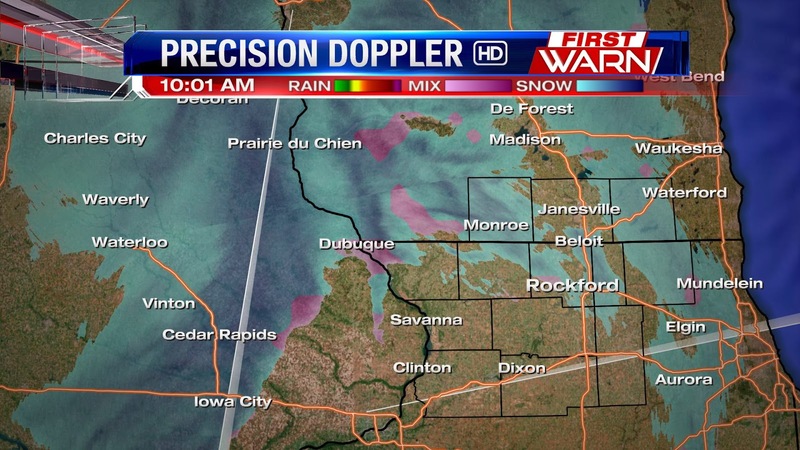 Winter Weather Advisory: Green, Rock, and Walworth in Wisconsin. Jo Daviess, Carroll, Stephenson, Winnebago, and Boone in Illinois. 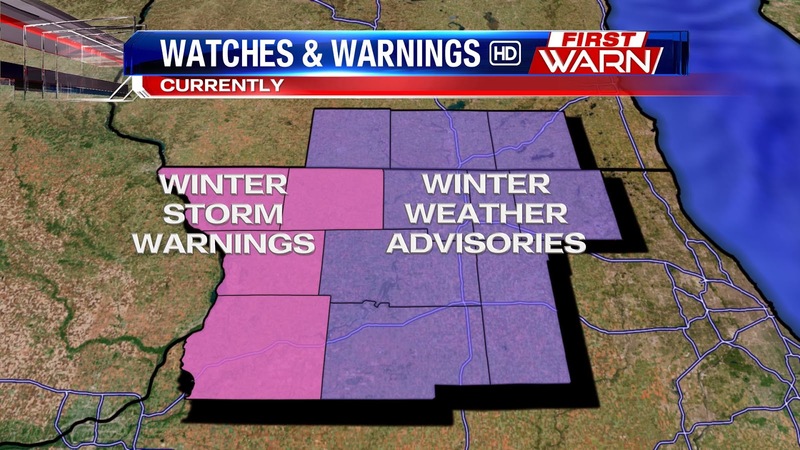 Winter Storm Warning: Whiteside, Ogle, Lee, DeKalb, and McHenry. Here's a closer look at snow totals through Saturday. The Rockford metro is looking at 4-6" of total snow, with slightly smaller amounts to our north and west and accumulations up to 10" possible to our south, especially in Lee and DeKalb counties. Friday afternoon weather update: A Winter Storm Warning is now in place for the following counties: Ogle, Lee, DeKalb, Whiteside and McHenry. A Winter Weather Advisory is now in place for Winnebago, Boone, Green, Rock, Walworth, Stephenson, Jo Daviess and Carroll counties. Snowfall amounts for areas under the Winter Storm Warning could receive totals in excess of 8" while counties under the Winter Weather Advisory will likely receive totals between 4" and 6". A few inches of snowfall will occur late tonight with the majority of snow falling Saturday morning. With this amount of snow coming in such a short amount of time, travel will be heavily impacted through the morning and possibly into the afternoon. It's best to just stay home Saturday if you don't have to go out. Remember, the snow will come with a bit of wind so some blowing snow will also be likely. A Winter Storm Watch remains in place for Winnebago, Boone, McHenry, Ogle, Lee and DeKalb counties beginning at midnight tonight and lasting through 6pm Saturday. Likely later today the Watch will either be upgraded to an Advisory or Warning with the track of the low shifting a little further north. Stay tuned for that! 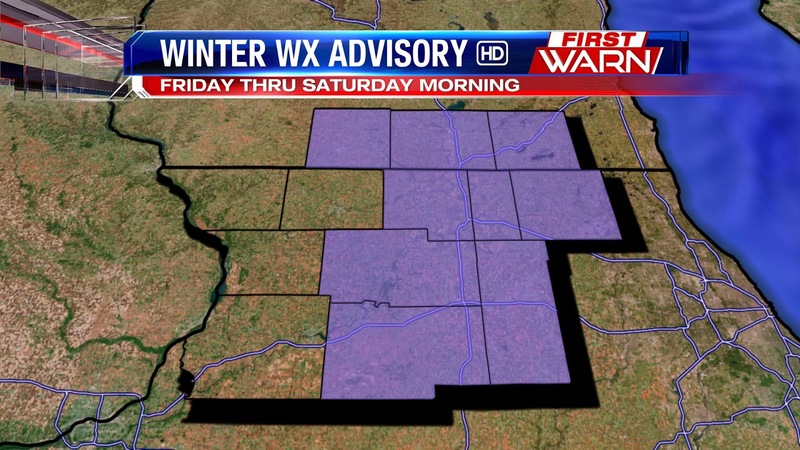 A Winter Weather Advisory remains in place for Stephenson, Jo Daviess, Carroll and Whiteside counties beginning at 6pm tonight and lasting through 6pm Saturday. As we've been talking about for the past several days, accumulating snowfall will occur late Friday night and through Saturday morning. Snowfall amounts will range from 3" to 6" with a few locally higher amounts. Accumulating snow will occur in central Illinois and Missouri with only a few lighter snow showers expected here this afternoon. If we do see any snow, it won't be much. Snow will begin to lift northeast through Missouri and Iowa as low pressure moves out of the central Plains. While a few snow showers will be possible in eastern Iowa and western Illinois after 10pm, most of it will occur after midnight with the bulk of snow falling Saturday morning. Snow, moderate to heavy at times, will be greatest from 6am to 11am with lighter snow expected during the afternoon. During the morning hours is when the majority of the snow will fall with totals near 6" in northern Illinois. The further north of the state line the lesser the amounts will be. Winds will be from the North/Northwest during the time of snow with speeds ranging between 10 and 20 mph. Significant blowing snow isn't expected, but during the more moderate snow visibility will likely be lowered and the snow will make travel Saturday morning difficult. It'll be best to stay inside Saturday morning and as conditions improve late Saturday afternoon travel may begin to improve. Snowfall will be winding down by the afternoon before high pressure moves in by Saturday night. Meteorologist Brandon Arnold, Meteorologist Max Tsaparis and myself will continue to monitor this evolving storm system through the weekend and keep you updated with the most accurate weather information! Thursday we saw some light snow in the area with high winds causing some road troubles, especially in rural areas. That's because winds are expected to gust up to 25mph. A high pressure system pushes in from the northwest, keeping us dry Thursday night and into the morning Friday but a warm front stalled just south of the Stateline will bring us our next weather maker. Some light snow returns Friday, starting up around noon in southern counties and in the evening elsewhere. This system could pack quite a punch and because of that, most of the area is under a Winter Storm Watch Friday night through Saturday. This may be upgraded to a warning on Friday--we'll keep you posted on the blog if it does. We can see anywhere between 3-6" of snowfall on Saturday with heaviest amounts near the I-88 corridor. After Thursday's snowfall it looks like we'll see a little more coming up for Friday and then again Friday night into Saturday. times, will be possible overnight Friday and into the morning hours of Saturday. It's possible totals may exceed four inches, but timing and track of the low will determine exactly how much will fall and who will see what. Doesn't look like we're quite done with the snow just yet. 10:55am Radar Update: Visibility is lowering in Northwest Illinois as the heavier snow begins to cross over the Mississippi River. 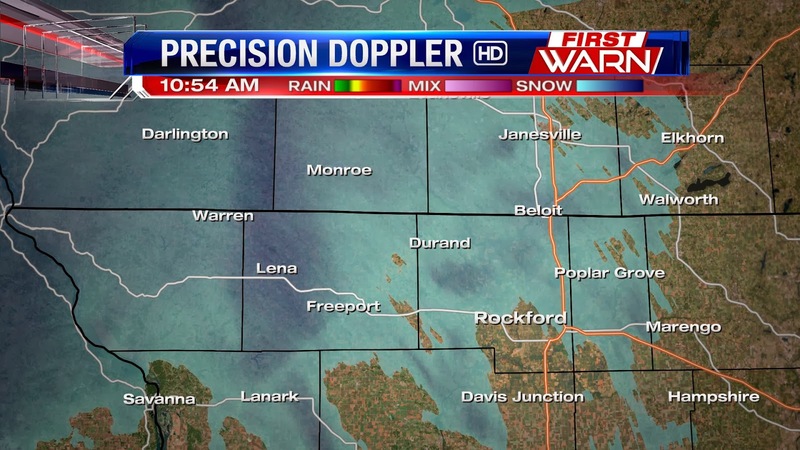 Heavier snow bands moving through Green and Stephenson counties. Other than just a few lighter snowflakes flying through the skies early this morning the biggest issue at hand will be the wind. Strong south winds gusting over 30 mph have caused blowing & drifting snow in mainly open and rural areas. In fact, we've already received a few reports of roads - IL Rt. 173 and Rt. 20 - that were already experiencing blowing and drifting snow. By late morning/early afternoon the heavier snow band in Eastern Iowa will have moved into Northern Illinois and Southern Wisconsin. A period moderate snowfall will be possible during the afternoon which, when combined with the wind, will lower the visibility to less than a mile and create a few slick spots on the roads. Snowfall accumulations won't be much and remain between 1-2" for most, but the impact the wind will have on the falling snow will be high. By this evening the majority of the snowfall will have ended and temperatures will fall back into the single digits late tonight. The first of three storm systems that will impact the Stateline over the coming week moves in Thursday and it could make for some messy roadways. Here's what you can expect. TIMING: Snow looks to move in around mid-morning, which for many of us will be around 8:00 or 9:00am, and continue through early evening. SNOW TOTALS: We're not expecting a major snow event, but 1-2" of snow will be possible for most areas with some isolated spots closer to the state line seeing up to 3" of accumulation. OTHER CONCERNS: Aside from the snow, wind gusts up to 35mph will cause lowered visibilities, blowing and drifting, and a few messy roadways. Be careful driving, especially late morning and into the afternoon. The cold that has griped much of the U.S. will begin to ease a little in the coming days. Temperatures will still stay below average, but at least we'll be in the 20's versus the single digits! 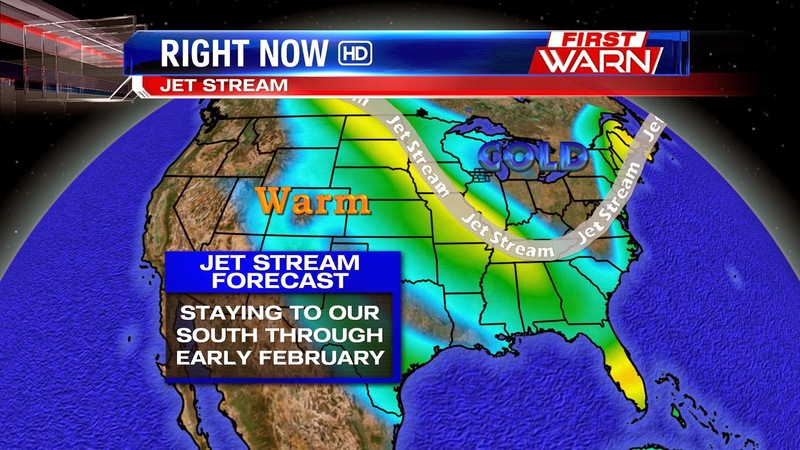 For the majority of the winter, the jet stream pattern has been locked in place. A ridge of high pressure in the west up through Alaska has forced a lot of the cold air in the Arctic to become dislodged and travel south into the Plains, Midwest and South. Another ridge in the North Atlantic has not allowed for much movement within the jet stream which has kept the cold sticking around for quite some time. That pattern, however, is going to change. Winds within the jet stream are going to turn a little more west to east versus northwest to southeast which will pull in a little more 'mild' Pacific air rather than the true Arctic air. What this will do, however, is set up a little more of an active storm track across the Plains and Midwest for fast moving storm systems. The first of those will come through Thursday and then again Friday night/Saturday. Going into next week the jet stream pattern will change even further with a trough building across the west (rather than the ridge) and more of a southwest to northeast flow across the Plains and Great Lakes. While warming temperatures aren't too likely with this pattern it does set up the potential for strong storm systems to move in from the southwest. These systems are able to work with the cold air to their north, but also the moisture from the Gulf. There have been signs of such a system coming in sometime during the Tuesday/Wednesday/Thursday time frame of next week, but unfortunately with pattern changes like these, the models have a very difficult time with the forecast and trying to forecast anything beyond three days become a little more challenging. What we do know is light snow will be likely Thursday with a cold front. Low pressure then developing along that front Friday will track northeast and could bring a little more accumulating snowfall Saturday afternoon. This winter has been brutal for the Stateline, but a winter storm in the deep south is showing that significant winter weather is all relative. A perfect example of this is the city of Atlanta. 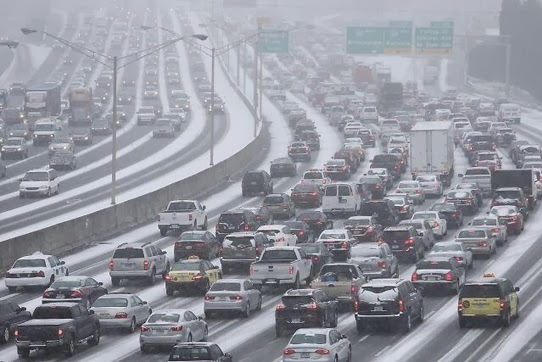 On Tuesday, highways all around the ATL became a parking lot thanks to about an inch of snow. You read that right... one inch of snow. This timeline shows just how quickly things went downhill. Green represent clear roads, while red represents traffic moving at less than 15mph. Do you feel like this winter has been colder and snowier than normal? No surprises here... you're right. Here are the stats to back it up. THE COLD: In the weather world, winter runs from December through February. A typical winter sees eleven days with temps hitting zero or colder. Including Monday's extreme cold, Rockford has already seen TWENTY days with below zero temps. Compare that to this time last year when we only had one day with temps below zero. Through January 25th, this has been the 8th coldest winter on record for Rockford. The forecast is calling for more sub-zero temps the next two days, so bundle up. 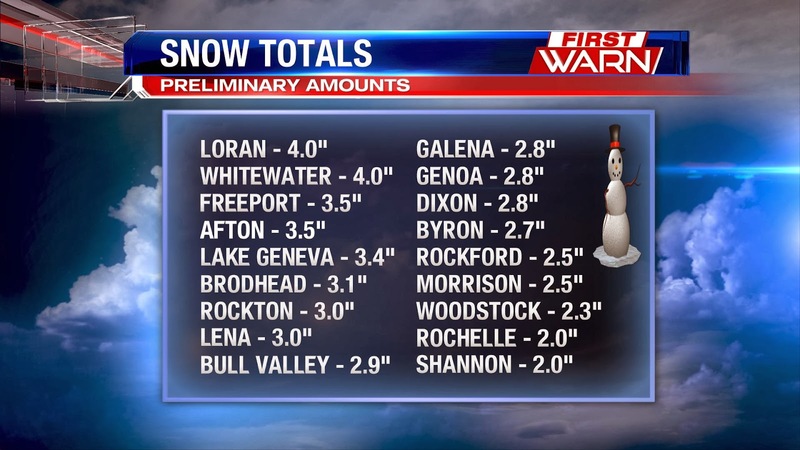 THE SNOW: Over the last 50 days, Rockford has seen accumulating snow on 27 of those days. That equates to snow every other day... and it's only the second time that has happened since 1905. We'll get a few days off from the white stuff, but snow chances are back in the forecast for Thursday, Friday, and Saturday. It may have been a bitter cold morning across the Stateline, but many who were up to see the sun saw a spectacular view in the sky. Sundogs! Sundogs form as a result of the sun's rays being refracted by ice crystals in the atmosphere. They're usually caused by cirrus clouds high in the sky, but ice crystals were still present in the lower atmosphere because of the blowing snow and cold temperatures! The Blizzard Warnings and Winter Storm Warnings from Sunday night have ended, but Wind Chill Warnings continue through Tuesday afternoon; Wednesday morning for Rockford. Wind chills Monday morning have dropped between -30 and -35 degrees and will likely remain in that range through the afternoon with temperature readings staying near -5 degrees today. Winds will still have a gust from the Northwest, but won't be nearly as strong as what they were Sunday night! Blowing and drifting snow will still be problematic through the evening commute in open and rural areas. In fact, as of 10:30am many rural roads remain closed due to drifting or snow plows/tows trying to dig stranded cars out of the ditch. For a list of road closures in Illinois, click here. Skies will remain clear through the afternoon and once the sun sets tonight temperatures are expected to quickly drop into the double digits below zero. Overnight lows will fall between -14 degrees and -20 degrees in many spots through Northern Illinois and Southern Wisconsin. Unfortunately, it won't take much of a wind to drop wind chill values as low as -40 degrees tonight into Tuesday morning! The sun will continue into Tuesday, but highs are only expected to remain a couple degrees below zero. Tuesday night winds will have shifted to the southwest and are expected to pick back. Temperatures will fall after sunset Tuesday night but will slightly rise through daybreak Wednesday with the southwest wind. Wednesday will still remain cold with highs only in the middle teens. 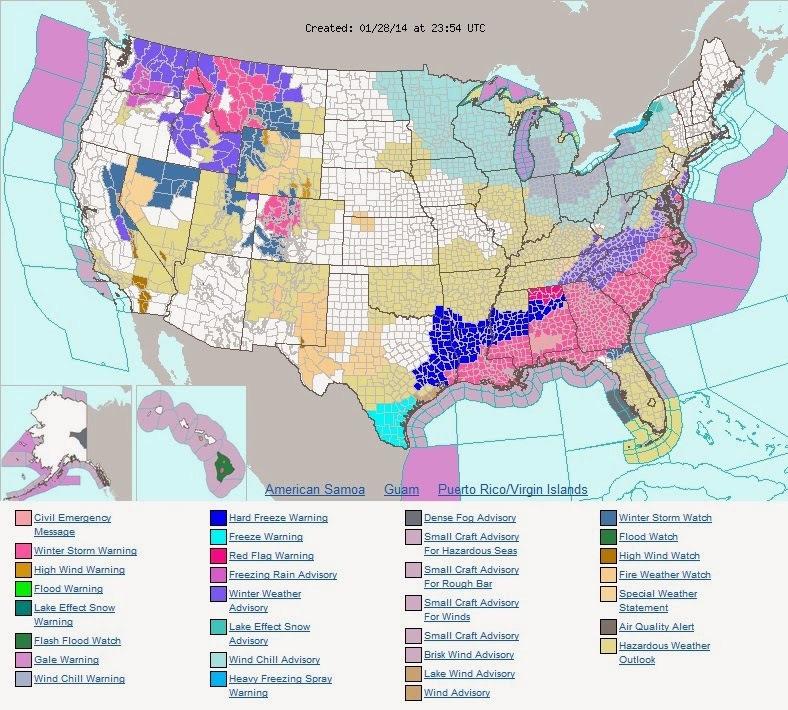 The National Weather Service has issued a blizzard warning til 3am Monday for counties colored orange on the map. Winter Storm Warnings are in effect for the rest of the area until 6am Monday morning. 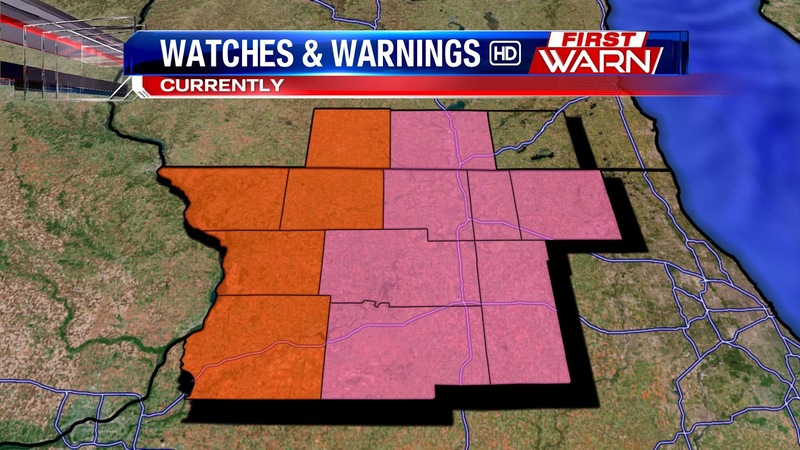 The warnings are in effect for wind gusts up to 60mph with whiteout conditions likely for all rural roads. By Monday morning, temps will plummet to near -10°F with wind chill values between 30 and 40 below zero. These raw, brutal conditions will persist til midday Wednesday. For a full list of closings click here. More Snow then More Cold...Sound Familiar? Saturday Night & Sunday Morning: More Snow! A Winter Weather Advisory will impact us through Sunday morning. That's all in anticipation of our next clipper system to dump anywhere from 2-5" of snow. 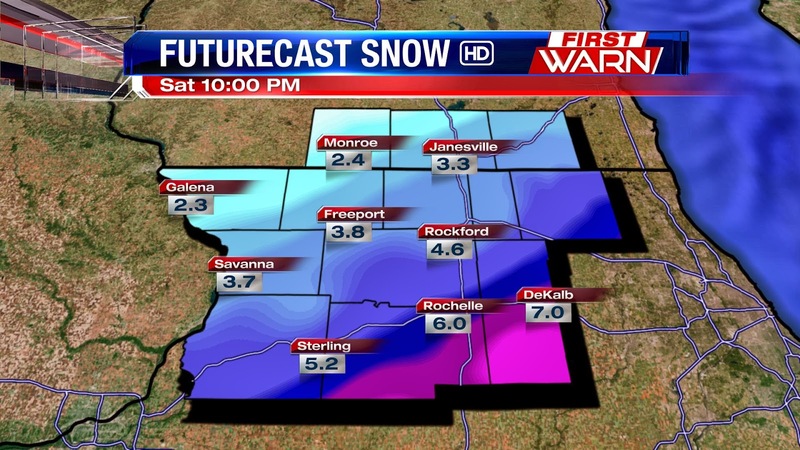 Southern counties can expect to get the heaviest amount of snow while in the Rockford metro, 2-3" is expected. Sunday Afternoon and Evening: Blowing Snow! The heaviest snow will end by lunchtime with light snow showers possible on the back end of the cold front. The greater concern in the PM hours of Sunday are the howling winds. That's why our western counties are under Winter Storm Warnings through Monday afternoon. Major snow drifts are expected with even near-blizzard whiteout conditions as well. This will mainly impact rural areas and will make traveling a nightmare. Let's start with Friday night. Strong winds have been causing some pretty bad blowing and drifting snow all day, but as 1-2" of snow moves into the Stateline Friday evening, that combination of snow and wind is going to make driving even more difficult through Saturday morning. Use extra caution if you need to go out. - Significant blowing and drifting. - Slick and snow-covered roadways. As for the rest of the weekend, Saturday will be our "quiet" day with some lingering blowing snow (especially in the morning) and temps falling throughout the day. Another storm system on Sunday will bring another round of snow in the morning and possible blizzard conditions in the evening as winds pick up in a hurry. Given how our winter has been so far, it should be no surprise that the forecast is full of winter hazards over the next seven days. Here's what you need to know to be prepared. As of 9:00pm, wind chills were already around -30° for parts of the Stateline. Expect those dangerous chills to stick around through the overnight. Wind chills by Friday morning will lighten, but we're still talking a feel like temperature of -20° to start the day. Fortunately, wind chills become more of a non-factor by Friday afternoon with highs in the low 20s. Even though the extreme cold is done by Friday afternoon, wind gusts up to 40mph will create a lot of blowing and drifting snow across the viewing area. That is only expected to get worse as our next round of snow moves in Friday evening. We're only expecting an inch or so of accumulation for Friday night, but roads will probably stay messy through Saturday morning because of the wind. This winter has been brutally cold, especially when you consider how mild last winter was up to this point. Thursday marks the 18th day this winter where temperatures have dropped below the 0° mark in Rockford. Compare that to last winter, where we saw temps below 0° once up to this point. Also worth noting, Rockford is already ahead of the average days we see dip below 0° for the entire winter. 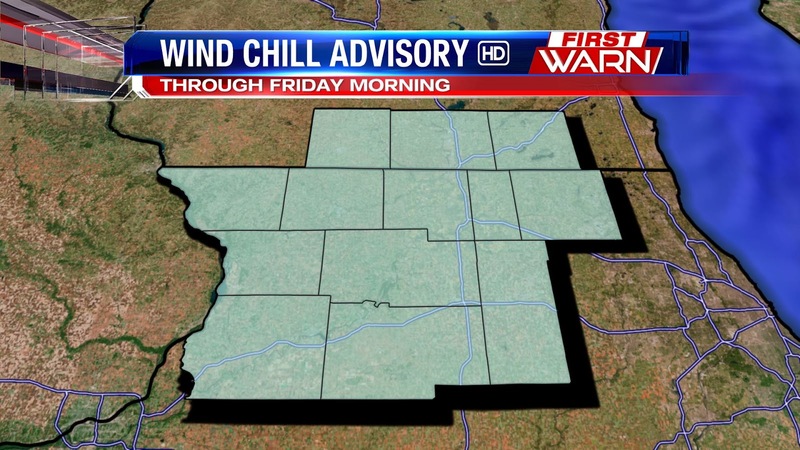 Bitter cold wind chills are expected once again tonight as another Wind Chill Advisory will go into effect with chills nearing -25 degrees to -30 degrees. Winds will quickly increase through Friday morning ahead of a fast moving clipper system that will move through Minnesota and Wisconsin by Friday evening. A strong cold front will move through Wisconsin and Iowa and then into Illinois by Friday evening with accumulating snowfall likely by Friday night. Snowfall amounts won't be much, maybe 1" to 3", but with strong winds sticking around through Saturday, blowing snow and lowered visibility will be an issue. Another fast moving clipper system is set to move in from the northwest Sunday, but this one could either track a little further north in Wisconsin or take a more southern track and leave us with more accumulating snowfall Sunday afternoon. Right now, a track from Minnesota to right along the Wisconsin/Illinois border looks possible which would leave us with possibly a couple inches of snow by Sunday evening. Stay tuned! Brrrr....it's cold outside! Winds have let up a little from yesterday afternoon and evening but there will still remain a little blowing and drifting snow through the afternoon. Wind chills this morning have dropped as low as -30 degrees in DeKalb and Galena! Wind chills throughout the afternoon will remain right around -15 degrees, but then drop back to -25 degrees to even -28 degrees this evening under clear skies. The cold doesn't look to loosen it's grip anytime soon. Temperatures next week will drop back into the single digits for highs! A Wind Chill Advisory will go into effect this evening for Northern Illinois and Southern Wisconsin as winds increase from the Northwest behind a strong Arctic cold front. Temperatures will drop below zero as skies clear a little through the overnight. Winds will gust as high as 35-40 mph later this evening and overnight which will cause wind chills to drop as low as -30 degrees! With those bitter cold wind chills in place, frostbite can happen within 30 minutes to exposed skin. Those type of chills will last through Thursday morning with temperatures remaining in the low single digits. So, again, we can't stress enough to make sure you dress appropriately Thursday morning: hats, gloves, scarfs, boats, snow pants, etc. Another issue for tonight will be blowing and drifting snow. While the snowfall from today won't be much, the strong wind gusts will cause the current snow on the ground to significantly blow and drift - especially in the open and rural areas. Blowing and drifting snow will also be likely through the day Thursday. East/West roads will likely experience the most significant blowing and drifting, but North/South roads will also experience a little as well. Many people have been wondering when this frigid cold is going to let up. The short answer is not any time soon. Want to blame something for this extended freeze? Don't look at the local weatherman... it's the jet stream. The jet stream is a strong current of air in the upper levels of the atmosphere. This current is constantly moving, and it helps dictate where areas of warm and cold air end up. Cold, arctic air is typically found north of the jet stream with warmer air to its south. First the snow, then the BITTER cold!